the smallest quantity which can be measured by the present interferometer. It is for this reason that it is concluded that the velocity of the motion of the solar system is at least two hundred kilometers per second and it may be much greater. The fact that the observed effect is dependent upon sidereal time and is independent of diurnal and seasonal changes of temperature and other terrestrial causes shows that it is a cosmical phenomenon. The previous observations made at Mount Wilson, while not sufficiently extended to determine curves of the kind just indicated, should, nevertheless, be consistent with these observations. In Fig. 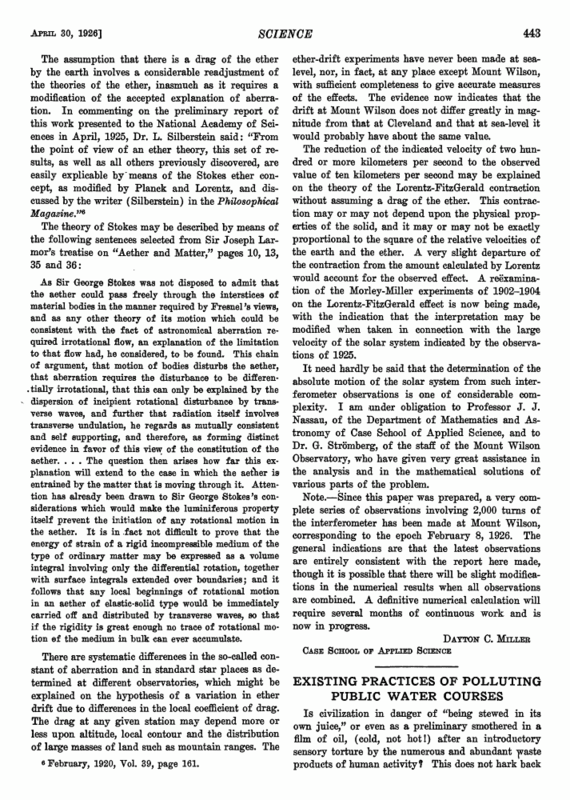 7 the results of the observations for April 15, 1921, are compared with the curves calculated from the observations of 1925, showing a very good agreement. parent relative motion at the point of observation is reduced from two hundred, or more, to ten kilometers per second, and further that this drag also displaces the apparent azimuth of the motion about 45° to the west of north. It is evident that the present experiments are no more consistent with the old theories of a stagnant ether than were those of Michelson and Morley of 1887, and of Morley and Miller of 1905; the present work is in no way a contradiction of the earlier results, but is rather a confirmation and extension of them. That a set of six characteristic curves obtained from observations which are wholly independent of each other, and which were made at times of year with extreme differences of weather conditions, so consistently fit curves depending upon the assumed motion, as shown in Figs. 5 and 6, leads irresistibly to the conclusion that the observed effects are related to the presumed cause. One is compelled therefore to consider whether there can be a possible readjustment of the theories of the ether that will account for the reduced velocity and other experimental results. The values of the quantities defining the absolute motion of the solar system as obtained from these ether-drift observations are in general agreement with the results obtained by other methods. 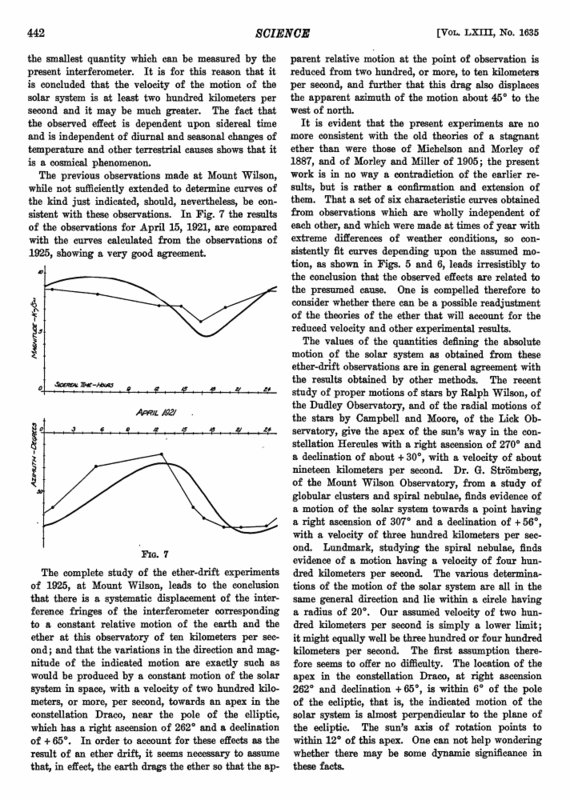 The recent study of proper motions of stars by Ralph Wilson, of the Dudley Observatory, and of the radial motions of the stars by Campbell and Moore, of the Lick Observatory, give the apex of the sun's way in the constellation Hercules with a right ascension of 270° and a declination of about +30°, with a velocity of about nineteen kilometers per second. Dr. G. Stromberg, of the Mount Wilson Observatory, from a study of globular clusters and spiral nebulae, finds evidence of a motion of the solar system towards a point having a right ascension of 307° and a declination of +56°, with a velocity of three hundred kilometers per second. Lundmark, studying the spiral nebulae, finds evidence of a motion having a velocity of four hundred kilometers per second. The various determinations of the motion of the solar system are all in the same general direction and lie within a circle having a radius of 20°. Our assumed velocity of two hundred kilometers per second is simply a lower limit; it might equally well be three hundred or four hundred kilometers per second. The first assumption therefore seems to offer no difficulty. The location of the apex in the constellation Draco, at right ascension 262° and declination + 65°, is within 6° of the pole of the ecliptic, that is, the indicated motion of the solar system is almost perpendicular to the plane of the ecliptic. The sun's axis of rotation points to within 12° of this apex. One can not help wondering whether there may be some dynamic significance in these facts.